Prior exercise research and the recently completed HF-ACTION (Heart Failure and A Controlled Trial Investigating Outcomes of Exercise Training) trial indicate that regular exercise represents an effective therapy in the management of patients with stable chronic heart failure (HF) due to left ventricular systolic dysfunction. This review summarizes the results from these studies and provides a guide for prescribing exercise. Regular aerobic-type exercise training improves exercise capacity; does not worsen and may, in fact, mildly improve cardiac function; and partially improves other physiological abnormalities that develop because of chronic HF (eg, autonomic and skeletal muscle function). Regular exercise is safe, improves health status, and modestly reduces ( approximately 15%) combined risk for cardiovascular death or HF-related hospitalization. Even greater physiological and clinical benefits appear likely in patients with HF who adhere to a higher volume of exercise (eg, 6 MET-hr per week). The exercise regimen should include an aerobic-type activity performed at least 30 minutes, 5 or more days per week, and at an intensity approximating 55% to 80% of heart rate reserve. Resistance training should be considered for patients who first demonstrate they are able to tolerate aerobic exercise training. Common to other interventions that also rely on human behavior, long-term adherence to exercise in patients with HF remains a challenge and requires additional research to determine strategies aimed at improving compliance. Areas of needed research include identifying which patient subgroup(s) benefits the most and determination of the optimal intensity, duration, and frequency of exercise needed to maximize clinical benefits and attenuate fatigue. Patients seen at the Center have refractory congestive heart failure and continue to be short of breath despite medications, device therapy (such as biventricular pacemakers) and heart surgery. These patients find that even doing simple activities like taking a shower or sitting in a chair are difficult. In addition, they cannot stay out of the hospital for very long – they are often regularly admitted for shortness of breath and fluid buildup in the legs. Such patients may be candidates for heart transplantation or a VAD. 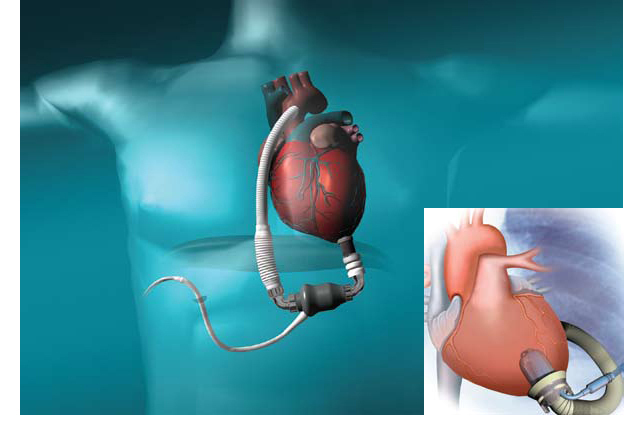 Typically, heart pumps are used temporarily while a patient awaits a heart transplant. Current first generation VADs, such as the Thoratec Heartmate XVE, are also used as a “destination” therapy – a permanent solution for heart failure. These devices can function for 12 to 18 months before they must be replaced. It is anticipated that a new, second generation of heart pumps, now undergoing investigational study, will increase the duration of ventricular assistance to two to four years. Nationwide about 2,500 heart transplant operations are performed annually and the Advanced Heart Failure & Transplant Center’s heart surgeons have collectively performed hundreds of heart transplants. Men with heart disease who also have erectile dysfunction die sooner than men who do not seek treatment for impotence, researchers reported. They found that men who had both conditions were twice as likely to die from any cause and twice as likely to have a heart attack than men with heart disease alone. The researchers expressed concern that using drugs such as Pfizer’s (PFE.N) Viagra or Eli Lilly’s (LLY.N) Cialis to treat erectile dysfunction could mask the symptoms that point to widespread heart and artery disease and said men complaining of impotence should be checked by a cardiologist. “It has long been known that erectile dysfunction is a marker for cardiovascular disease,” said Dr. Sahil Parikh at University Hospitals Case Medical Center in Cleveland, Ohio. The first impotence drug, Pfizer’s Viagra, known generically as sildenafil, was at first developed to lower blood pressure, he said. “They realized it had this other effect, which patients quite enjoyed,” Parikh said in a telephone interview. Viagra and rival drugs such as Eli Lilly’s Cialis and Bayer AG’s BAYG.DE Levitra all work by increasing blood flow. But while the erectile dysfunction drugs help blood flow all over the body, they do not treat the underlying hardening and narrowing in the arteries that is causing the problem. “If patients have erectile dysfunction, we have to be very aggressive about screening and treating them for heart disease,” Parikh said. Today goes “Inside the O.R.” Dr. Nancy Snyderman will give exclusive access to life-changing procedures live as they happen. She’s at University Hospitals Case Medical Center in Cleveland, Ohio, where a heart surgery is under way with Dr. Mauricio Arruda. The Division of Cardiovascular Medicine, a premier center for comprehensive care of patients with diseases affecting the heart and vascular system, has a goal to create a national center of excellence in cardiovascular research and physician education, as well as patient care. CWRUmedicine’s Cardiovascular Medicine’s Research & Innovation Center is the largest biomedical research center in the state of Ohio, and one of the top 15 in the country. Our Cardiovascular Research Center works specifically to improve the clinical diagnosis and treatment of cardiovascular diseases. We use translational research (the clinical application of scientific medical research from lab to bedside) and advancements in biomedicine to improve industry standards and quality of patient care.